A very popular appetizer at parties and restaurants in New England is bacon wrapped sea scallops. While this is a delicious starter, I wanted the same flavors for an evening meal and created Pan Seared Sea Scallops With Bacon Lardons On Creamy Corn Polenta. 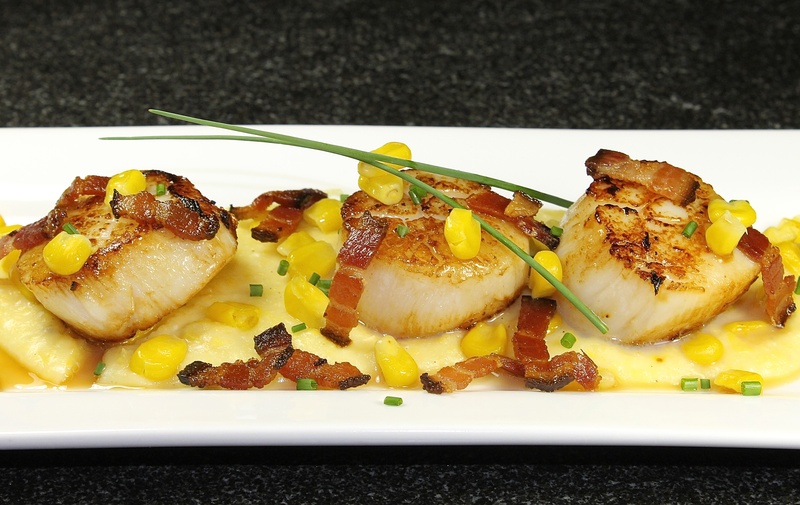 Each bite of crisp, salty smoked bacon, tender sea scallops, and creamy corn polenta is a nice contrast of textures and flavors that is a true taste treat in your mouth. *The basic ratio for cooking polenta is 1 part polenta to 4 parts of liquid. Divide the corn kernels in half. Add the half & half to a small sauce pan and bring to a simmer. Add one half of the corn and simmer for 3 – 5 minutes. Using a stick blender, blend until you have a smooth consistency then set the mixture aside. Heat olive oil and 1 Tbsp. butter in a small sauté pan until the butter is melted. Cook the remainder of the corn over medium heat for 3 – 5 minutes, then set aside. Add the pureed corn and cook a few minutes more then stir in the sautéed corn kernels, reserving a few for garnish. Stir in butter and season to taste with salt and pepper and keep warm. The polenta will thicken as it cools so prepare it as close to serving time as possible. Add more liquid to loosen, if necessary. **Dry scallops are all wild and natural. They are not treated with any chemicals whatsoever and will brown nicely. Slice the bacon into 1/4 inch slices, place in a nonstick sauté pan and cook until crisp. Remove and place on paper towel. Reserve the bacon drippings. Dry the sea scallops well and season both sides with salt and pepper to taste. Add the oil to the bacon drippings. When the oil is shimmering, add the scallops in one layer and cook undisturbed for one and a half to two minutes or until golden. Turn and cook for approximately another minute or two until golden brown. They should be be a little translucent in the center and almost firm to the touch. Do not over cook or the scallops will be tough. ***Be sure to not overcrowd the scallops or they will not brown properly. Cook in two batches, if necessary. To serve, stir the polenta well (adding a little half & half or liquid if necessary) then spoon a portion in the center of a plate. Top with a portion of sea scallops, sprinkle with the bacon lardons, the reserved corn kernels and garnish with chives. This dish had all the flavors of bacon wrapped scallops that I love as an appetizer but offered so much more for an evening meal. The creamy corn polenta, the succulent scallops and the bacon lardons were a perfect combination of salty, sweet, soft and crispy. I believe this recipe would also make a wonderful first course, serving one or two scallops a person, depending on the size of the scallops. This entry was posted in Uncategorized and tagged appetizer, bacon lardons, bacon wrapped sea scallops, creamy corn polenta, Dinner, food, recipe, sea scallops, seafood. Bookmark the permalink. Scallops are my favourite food! I love them! So yummy. Hi Misky, I agree with you about loving scallops…they are delicious. Hi Mad Dog, I’m glad you like the looks of this dish…it really was delicious. Karen, what a magnificent meal! Thank you for your nice compliment, Mandy. I hope you have a nice weekend as well. I appreciate your kind words, Prudy. The flavors and textures in this meal worked so well together…I’m happy to know that you like it. Thank you! Yum, Yum, Yum! Karen, one of my favorites! Hi Debbie, Scallops are one of my favorite seafoods, I’m glad you like the dish. Thank you. This looks delicious. You are in an area to get lovely sea scallops. I like the idea of lardons rather than wrapping the bacon. Hi Bonnie, So true about New England seafood, the sea scallops here are big and delicious. The lardons went perfectly…bite size pieces to go with both the scallops and the polenta. I agree with you Gary, they are a great taste combination. Thank you for your nice compliment. What a lovely combination of flavours. I don’t get scallops nearly enough and with the crunchy salty bacon and soft and creamy sweet corn polenta I know I’d enjoy it. Thank you for your nice compliment, Boleyn. I do think you would enjoy this dish…it is a good combination of flavors and textures. This looks sooooo delicious, sitting down to breakfast and I would love to have this dish in front of me right now. My daughter will love this dish also so am forwarding your post to her. Hi Norma, I know how you feel…when I look at the photo, it makes me want to prepare the dish again soon. 🙂 Thank you for your nice compliment and for passing the recipe along to your daughter. I just love this recipe. Scallops are one of my favourite things and this is a lovely way to serve them. My dad used to cook scallops with bacon so it also reminded me of him. We love scallops Karen..This looks so fresh with the corn..the sweetness with the saltiness must be wonderful. Hi Monique, The combination of sweet and salty really works well with the sea scallops. I’m glad you like the dish, thank you! I adore scallops wrapped in bacon so this is right up my alley. The polenta is a perfect stage for them. What a beautiful dish. Hi Karen, I think scallops wrapped in bacon are a hard to resist appetizer. I wanted to create the same flavors but in a way to enjoy at dinner time. I’m glad that you like the way I presented the dish. Thank you! That sure does look and sound delicious Karen. I made creamy polenta last month for a recipe test and it was TDF! We loved it and I think this combo would be wonderful. Hi Eva, I think you would like this polenta with the addition of sweet corn. I thought it went great with the scallops. Thank you for your nice compliment. What a gorgeous presentation Karen. We adore big sea scallops and these must taste wonderful with the bacon lardons, corn and creamy polenta. Thank you for your lovely compliment, Sam. My husband and I thought this was a winning combination of flavors. There’s something about the creamy texture of the scallops and the creamy polenta with a little crunch of that bacon that makes this perfect. Great idea and thanks for sharing. Hi Lea Ann, Yes, the flavor and texture of this dish was indeed good. I’m happy to know that you like the recipe and appreciate your nice compliment. What a great creation. You put together a wonderful comgination of flavors. Definitely want to try this. I appreciate your lovely compliment, Jovina. I do think you would enjoy this dish…my husband and I certainly did. What an appealing dish. It has that characteristic ‘look’ that I associate with your food: colourful and elegant. I like the idea of using bacon lardons instead of wrapping the scallops in bacon. Sometimes things wrapped in bacon can be more difficult to eat, and have a less appealing appearance underneath the bacon. Funny thing, I was thinking about you as I waited for my reader to load, and voila, there was your post, first in line! Hi Rachel, It is nice to have a Texas girl (like myself) stop by for a visit. I’m glad you like the looks of this meal…thank you! Scallops are one of my most favorites splurges – they are so delicious! This meal looks perfect with all the sweet and salty flavors. Hi Amy, I totally agree with you about scallops, they really are great. I’m glad that you like the recipe, I thought the flavor combination was a good one. Thank you! Oh, how very wonderful! The flavor combinations sound fantastic. Incorporating polenta is pure genius. You are a culinary genius! Yum!!! I really do appreciate your kind words, Tin Man. 😀 I think the sweet corn polenta went well with the scallops and salty bacon. I’m happy to know that you like the dish. I think scallops are such a great seafood to pair with bacon. Some seafoods are way too light for it, but scallops are pretty meaty. Love the creaminess of something like polenta, grits, or risotto with it too. Hi Jaleh, I’m glad you agree about the combination of bacon with scallops and I’m happy you like the dish. Thank you. This recipe is just what I was looking for. My friends are coming for dinner next week and I will make it for them. Thank you Karen. Hi Gerlinde, I’m happy to know that my timing was good with this recipe. I hope you and your friends will enjoy the meal as much as my husband and I did. Thank you for your nice compliment. This was a savory dish which was outstanding. We licked our plates it was so good. The bacon added a more complex point to the dish. I added a white wine reduction after the scallops were done and drizzled it over the finished plated entree. Thank you. What an impressive meal Karen, lovely combination. Never have been to New England, some day…. Thank you Cheri, for your lovely compliment. This meal does make a nice presentation but is ever so simple to prepare. I do hope you get a chance to visit New England someday…it is especially pretty in the fall when the leaves are changing. A very elegant starter Karen. Getting the polenta right is an art in itself. This looks delicious. I always love the scallop and bacon combination and how wonderful that you’ve added polenta to the plate, Karen. What a satisfying dinner! Hi Ksenia, There is something really nice about the bacon and scallop combination that works. I do think the corn polenta complemented all the flavors. Thank you for your nice compliment. A Michelin Star dish Karen. I am on the hunt for “dry” scallops. I appreciate your kind words, Madonna. I’m happy to know that you like the meal. Yes…do use “dry” scallops whenever you are going to sauté them, wet scallops will never sear and brown properly. Simple and delicious. Just how I like it. I love that you used corn and polenta. It takes something classic and makes it seasonal. Thank you for your nice compliment, Amanda. This really is a simple dish to prepare and so good. Adding fresh corn to the polenta gives it extra flavor…we thought it was delicious. Looks and sounds very good Karen. I really like the presentation and the scallop crust looks perfect. Hi Larry, I’m glad that you like the presentation of this meal, thank you. I think the trick to getting that lovely sear on the scallops is using a hot nonstick pan, not crowding them and making sure to use “dry” scallops. Oh my gosh, Karen, would you come and make this for me for dinner? I’ll run get the scallops right now! Indeed, this is pretty popular here in New England. Thank you for stopping by Dana…it is always nice to meet another New Englander. I’m glad you like how I took the flavors of a traditional New England appetizer and turned it into a nice evening meal. What isn’t there to ♥ about this meal! This looks absolutely wonderful. My middle son would definitely enjoy this, all his favorites in one meal…polenta, scallops, bacon and corn. Wow, might need to consider this for his birthday dinner. Hi Gretchen, It sounds like your son and I have similar tastes. If you do make it for his birthday celebration, I hope he will enjoy it as much as my husband and I did. Thank you for your nice compliment. Hi Ngan, I have to agree with you…bacon and scallops are a great combination. The sweet and creamy corn polenta was indeed a delicious base for the scallops. I’m happy you like the dish, thank you! This is now on the menu for this weekend…Thank you for the step-by-step instructions. I so love the combo of scallops and bacon! Match made in heaven. Never paired the two with polenta, though (grits is my usual). I need to do this — looks terrific. Thanks. Hi John, I totally agree about it being a match made in heaven…I think it is a combination everyone enjoys. Growing up in Texas, I have eaten my share of grits and they could certainly be used in this recipe. Thank you for your nice compliment. What a great way to enhance bacon wrapped scallops. I vote for having it as a main course. Stoping at just 2 or 3 as an appetizer would be a little too hard to do. Hi Diane, I’m glad you like my variation of bacon wrapped scallops. We had them as a main course but I was just saying to my husband that I’m going to serve them as an appetizer the next time we entertain. Oh my, Karen, this one is a beauty… sharing via my social media networks right now! Your so nice Lizzy, thank you! Thank you Jess, I’m glad you like the looks of this dish. So true about scallops and bacon being such a good combination. I thought the polenta was a nice compliment with the sweet corn paring well with the scallops. Oh my, that’s a beautiful plate of food. All the flavors work together to make every mouth happy. Your scallops look perfectly seared and I love that corn polenta! Hi Laura, A hot pan is important to getting that nice sear. I’m happy to know that you like the recipe for the corn polenta…it went so well with the scallops. Thank you for your nice compliment. Scallops, bacon, and polenta, what could go possibly wrong with this? Delicious flavor combination! Hi Kathryn, I’m happy that you like the meal I created, thank you. I do think it is a great combination of flavors. I think the only thing that could possible go wrong when preparing this meal is if someone overcooks the scallops. Overcook them and they will be tough. Agree on that one! But I must confess, I gravitate towards anything with bacon in it. And since I’m from Texas, the polenta really grabbed me (it’s like grits to me!) and then now living in the PNW for 20 years, I’m fan of all things seafood too. Hi Kathryn, I think we all love bacon and it goes great with sea scallops. Whether living in the Pacific Northwest or New England, both coasts do provided us with great seafood. Since we are both from Texas, I agree with you about grits. 🙂 Thank you for your nice compliment. This looks perfect! I’ve never loved bacon wrapped scallops as much as I wanted to because of how bacon-wrapped anything seems to prevent the crisp I want on the bacon and the sear I want on the “anything.” I bet the corn adds the perfect sweetness, too! Hi Plumdirt, You are correct…it is hard to get bacon crispy when it is wrapped around the sides of food that is just seared. I think you would enjoy this dish as the scallops are seared nicely and you have crispy bacon. I do think the corn adds a lovely sweetness to complement the other ingredients. Thank you for your compliment. Those scallops are so meaty and succulent. And I love the combination with bacon! YUM! Hi Angie, We are so lucky to have wonderful large scallops available to us here in New England. You are right about the combination of scallops and bacon being a good paring. Thank you for your nice compliment. The dish looks delicious. I have a new local fish shop that I have yet to try, it’s a while since I ate scallops so I must buy some. Hi B, I hope your new fish shop has nice scallops…they are so good. I’m happy that you like this dish, thank you! Thank you Roger, I’m glad you like the post. Frozen corn will work equally well with your fresh scallops. Enjoy! Looks delicious. I rarely eat scallops (difficult to get) but I love to eat polenta. Karen – your timing could not be more perfect! Mark and I are traveling and we are entertaining friends at our Airbnb tonight. I had planned scallops and something with corn, and along you come with this perfect recipe! Looking forward to making this tonight! Hi David, I’m delighted that my post came your way at a good time. I hope you and your friends enjoyed your meal. Angels on horseback (oysters wrapped with bacon) are always a big hit at Louisiana cocktail parties. Scallops sound just as delicious, and your revision of the menu sounds terrific. Thanks for the recipe. Hi Darryl, My husband is a big fan of angels on horseback. I’m happy that you like this recipe and appreciate your nice compliment. Absolutely scrumptious, Karen! You’re presentation is better than a restaurant! It must be telepathy: I made scallops last night too! I love scallops practically in every possible way (maybe apart from a vanilla sauce I still remember after long years…) and I agree bacon is a perfect company. Your dish is just gorgeous and the scallops perfectly browned (this is not always obvious…). Goodness this looks and sounds amazing Karen! I love scallops and bacon – the corn polenta makes it extra fabulous! Wow! I love scallops. This sounds fantastic. Hi Chunklet, If you love scallops, I think you will really enjoy this dish. Thank you for your nice compliment. I recently found a good place to get seafood in Kitchener, Ontario. They also have good scallops, but my scallop experiences are limited. Thanks for sharing this, Karen, because it’s definitely going to be something I will try with scallops! Thank you Ming, for your nice compliment. I hope you enjoy the dish if you get a chance to try it. Hi Uru, This dish really does have a nice contrast of textures and tastes. Thank you for your nice compliment. Adore scallops and when we’re in England can get hold of them quite easily – love the idea of serving with Polenta…perfect! Hi Tanya, I believe you would enjoy how well the corn polenta goes with the scallops. Thank you! I wish my hubby would eat scallops b/c I adore them! This looks like a restaurant worthy dish…and I’d love to dive right in! Thank you Lindy, I’m happy to know that you like this meal…it does make for a pretty dish. I just woke up and now I’m craving for a meal like this! This looks like an entree in a fine restaurant, Karen! So marvelous! I love scallops and polenta. I appreciate your lovely compliment, Pat…thank you very much. I thought this was a winning combination. Oh! This is so delicious! I’ve just realized that I’m veeery hungry! Great job, Karen! Hi Tandy, We are indeed lucky to have such a wonderful supply of fresh seafood available to us here in New England. I’m glad you liked our dinner, we are still talking about how good it was. Thank you Charlie, This was one dish that was definitely as good as it looks. Thank you for your nice compliment. Wow they look succulent, tender and juicy. I love seafood and scallops is one of them. Yum! Hi Raymund, I would say that you got the description just right…they were delicious. Thank you for your nice compliment. I am grabbing a copy of this recipe immediately! I sounds so delicious and I love the blend of flavors, Karen. Well done! I just want to get my fork in there and grab one of those scallops making sure to get a little polenta along the way. This looks so delicious and is a winner of a recipe! I’ve always been afraid to try cooking scallops because I keep hearing how they can easily become tough and chewy, but how could I miss with bacon in the mix. Hi Kristi, Please do try cooking scallops. Just remember to use a hot nonstick pan with a little oil and do not overcook them. They only need to cook for a minute or two on each side and should still be a little translucent in the middle. I do believe you would enjoy this recipe. Just a few weeks ago I cooked my first scallops and since they came out so well – I want to try it again and I know this will be the recipe I use. I hope I can get the kind of scallops you recommend but I’m not sure they will be available in land locked Oklahoma! Hi Kelli, I’m glad to hear that you are wanting to try scallops for a second time. I would call your markets and ask about their scallops, just because you live in the middle of the country doesn’t mean that you can’t get “dry scallops” as I’m sure they are brought into Oklahoma for the restaurants. Looks full of flavour for bacon lovers! Hi Ladyfi, I appreciate your nice compliment. I know you don’t eat meat but I do think that you would enjoy the creamy corn polenta. I love scallops and it is such a pity I can’t find them so easily here! They look delicious Karen! Hi Katerina, I’m happy to know that you enjoyed the recipe…thank you. I do understand that scallops might be hard to obtain for many of my readers. I love polenta, I love, bacon and I love scallops. I can also eat everything in this recipe. It would be something special to serve up as an appetizer for guests. Karen, that’s a lovely dish! Every component is exactly what I’d like to have for dinner. Beautiful photography too….so enticing! I appreciate your nice compliment, Barbara. I do think all the ingredients worked well together. I’m happy to know that you liked the recipe and photo, thank you! Hi Denise, your comment made me happy. 😀 The creamy polenta and bacon worked really well with the sea scallops. I’m glad you like the meal, thank you. I appreciate your nice compliment, Betsy. Sea scallops are a real treat…I hope you get to enjoy some before long. Hi Sarah, I do think this dish would make a lovely appetizer when entertaining. I glad you like the recipe, thank you. Absolutely gorgeous meal! Perfectly seared scallops are one of my all time favorites and the corn polenta bacon combination sound perfect together! Thank you Jan, for your lovely compliment. If you like sea scallops, then I think you will really enjoy this meal. Looks delicious! We should all eat more polenta, I think. The other day some friends brought over an appetizer of little rounds of polenta topped with melted cheese, tomato and basil. Hi Jason, You gave me a chuckle and I do agree with you about eating more polenta. 😀 I’m glad you like this dish, thank you. I think you would enjoy the corn polenta, it is delicious. What a lovely dish and you seared them perfectly! Thank you Angela, I’m glad you like this dish…my husband and I thought it was delicious. you had me at creamy corn polenta! Wow I need to try that NOW! Karen, It looks phenomenal! Love the photograph! Bacon and scallops is such a good pairing ! I think it is the sweetness of the scallop with the saltiness of the bacon. I love the corn polenta recipe ! Hi Carolyn, I have to agree with you…I think the flavors go very well together. Thank you for your nice compliment…the corn polenta is delicious. Hi Karen! You have three of my all time favourite ingredients, right there! In fact, there’s something so reassuring about the clean taste of fresh scallops, sweet corn and heavenly/salty bacon! I overdosed on so many wonderful & weird foods whilst I was in China, this dish would be heaven for me right now! Hi Alli, I’m happy that is meal fits into your all time favorite ingredients list. My husband and I loved it…I hope you will as well. Karen, what a picture perfect presentation of your sea scallops – I love how sweet they taste and I love to cook with them but, alas, around here they are hard to come by. Next time I spy some at my fishmonger, I will remember your wonderful recipe and your elegant presentation! I appreciate your kind words, Andrea. I’m happy to know that you like the recipe and the presentation. Hopefully your fishmonger will have scallops one day as I think you and your family would enjoy this meal. Scallops and bacon – such a great combination. Love the corn polenta too, Karen, perfect for mopping up any juices from the scallops. Hi Hester, You are right, the polenta does collect the juices from the seared scallops. I’m glad you like the combination, thank you. Hi Dedy, Searing the scallops in the bacon fat added lots of flavor…I’m glad you like the recipe. A wonderful mix of flavors especially the scallops and bacon….haven’t had bacon and scallops in a long time….sounds like dinner soon. Hi Donna, Sweet scallops and salty bacon really are a great combo. I do hope you will enjoy the meal. oh wow, that polenta Karen! I’m dying over it! I must start adding bacon to my polenta. Hi Paula, The corn polenta is sweet and delicious. Adding the scallops and topping with the bacon made for a tasty meal. Hi Terra, I think you and your husband would enjoy this meal…I know that we certainly did. Thank you for your nice compliment. This is definitely a 5 star gourmet dish! Love sea scallops and yours are cooked to perfection. Thank you Amy, for your lovely compliment…it is very much appreciated. My husband and I thought this meal was delicious. I saw this last week and was so going to make it…until I saw the price of the scallops. Yikes! (man did they go up!). How do you think mahi mahi or shrimp would do with the recipe? Hi Ruth, Scallops can be expensive but you don’t need many if you use the large ones and there is no waste. I think shrimp would be good…I suggested that to one of my readers whose husband doesn’t like scallops. I agree, this is a 5 star gourmet dish, and you made it so easy to make. 🙂 202 comments, no wonder! Well, I’m embarrassed because I’ve never had scallops before! I’ve only seen them cooked on t.v. and have been too nervous to order at a restaurant. But you’re giving me confidence to try them and since my husband loves them, maybe I’ll steal one off his plate and then use your recipe to make at home. Anything with bacon is a hit with me! Hi Laura, The next time you husband orders scallops definitely try one. Once you have, I think you will enjoy preparing this recipe…I think your husband would happy. A fabulous combination and dish! Really mouthwatering. Thank you Rosa, I do think this combination of ingredients really complemented each other well. So delicious! And I love how you prepare your polenta…as I have not had the greatest success with it. I will try your method next time. Oh my goodness.. so very many of my favorite things! Lovely recipe, and I am so glad to have discovered your blog! Thank you Debra, I’m glad you you liked the post and think it was helpful. I have eaten very fresh paper thin slices scallops that were only “cooked” by the drizzle of a little lime and then wonderfully seasoned. While I loved them, others at the table wouldn’t even try them because they were “raw”. If I had to choose between under or overcooked scallops, it would definitely be undercooked because you can always put them back on the stove and cook them a few seconds more. If they are overcooked, they get rubbery. I do hope you will try cooking them again. Really wishing I could reach through the screen and gobble this all up! YUM! Bacon and scallops … a classic dish. Scallops I like, but don’t eat it very often. My friend had it for the first time in Chicago and she loves it now. Scallops isn’t my first choice on a seafood menu … but if I order it – it has to have bacon in the description. Yours looks so tasty. Can I take one ???? Thank you for your nice compliment, Viveka. Scallops have such a delicate flavor but pairing them with bacon works so well. That looks so good! I’m always nervous cooking scallops because there is a fine line between cooking them perfectly and over cooking them. Thank you Ducky, for your nice compliment. I believe this was one of the best scallop dishes that I’ve prepared. You are right…you must be careful to not overcook scallops or they will be tough. Doing a little catch up reading…. Hi Carol, Nice to have you catching up on my blog. I made this with fresh summer corn and it was a delicious dish…I’m glad you like the recipe. Thank you. Have mercy! Karen that looks so good… Now I’m really hungry. 😀 Hugs. Hi Teagan, Thank you for your visit and you sweet comment…it gave me a real smile. This has to be one of my all time favorite creations, I’m happy to know you like my recipe.